A court hearing is scheduled today, June 29, seeking to halt operations of Valley Apothecary, Ketchum's newest drug store, which opened for business last week. 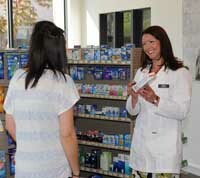 Proprietors Cathy Swink and Paula Shaffer, pharmacists who previously worked for SuperValu, the parent company of Sav-On pharmacies and Albertsons, opened the drug store despite the filing of a lawsuit against them earlier this month. Attorneys for SuperValu allege that Swink signed a noncompete agreement that prohibits her from engaging in business activities within 15 miles of the Sav-On pharmacy at 911 N. Main St. in Hailey. That location is 11.1 miles from Valley Apothecary, in the Copper Ridge building in Ketchum. The suit also claims Swink attempted to divert customers from the Sav-On pharmacy to her new business venture. In the complaint against Shaffer, SuperValu alleges she helped Swink breach her contractual obligations to SuperValu and is in violation of terms she agreed to as an employee of the company. SuperValu on June 13 filed a motion for preliminary injunction seeking a halt to Valley Apothecary's opening and prohibiting Swink and Shaffer from soliciting customers of Sav-On's Hailey pharmacy. "It is unrealistic to think that any individual such as Shaffer, and especially under this circumstance of Shaffer's involvement with another prior pharmacist of SuperValu, Swink, would be capable of completely isolating and ignoring highly relevant information regarding her knowledge of SuperValu's pharmacy operations. It is virtually inconceivable that Shaffer or Swink, or anyone, for that matter, is so astute and so disciplined that they could simply 'forget' everything," the company stated in a memorandum in support of the motion. On June 22, both Shaffer and Swink filed affidavits and memorandums in opposition to the motion for preliminary injunction. Part of their defense relies on their assertion that the apothecary's business model is different from their previous employer's pharmacy. "Compounding ... involves the combination of medicines and other ingredients to create a custom medication that is not otherwise commercially available," Swink's affidavit reads. "These capabilities were not present at SuperValu's pharmacy in Hailey." Her statement also contends that compounding requires specialized equipment, in which she and Shaffer have invested and which they say SuperValu's pharmacy in Hailey doesn't have. She further states that Valley Apothecary plans to provide compounded veterinary prescriptions, which also is in contrast to the SuperValu pharmacy. "In short, our compounding practice will be completely different from what SuperValu offers," she stated. Swink also states in the affidavit that she was unaware that as she was accessing her E*Trade account to receive a stock grant from SuperValu in 2008, she also was accepting a noncompete agreement and other terms and conditions.